The 2011 Spanish general election was held on Sunday, 20 November 2011, to elect the 10th Cortes Generales of the Kingdom of Spain. 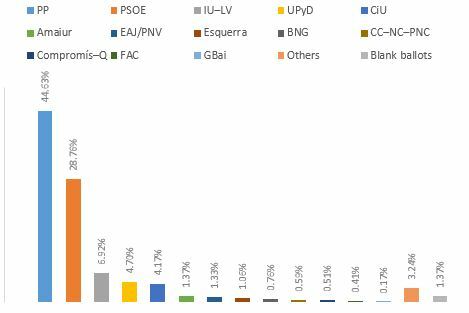 All 350 seats in the Congress of Deputies were up for election, as well as 208 of 266 seats in the Senate. 26-Sep-11 The Council of Ministers convenes to approve the decree ordering the Cortes Generales' dissolution and the calling of the general election on the advice of the Prime Minister. Subsequently, the decree is ratified by the King. 27-Sep-11 The decree enters into force by its publication in the BOE. Parliament is officially dissolved and the general election is called. Official start of the electoral period. 07-Oct-11 Deadline for parties intending to contest the election in coalition with other parties to communicate it to the appropriate electoral boards. 12–17 October 2011 Time limit for parties intending to contest the election to submit their candidacies to the Electoral Board. 19-Oct-11 Submitted candidacies are provisionally published in the BOE. 22-Oct-11 Deadline for Spanish electors residing abroad to apply for voting. 22–26 October 2011 Sweepstakes to appoint members of the polling stations. 25-Oct-11 Candidacies for parties, coalitions and groups of voters standing for election are proclaimed and published in the BOE after a period of notification and amendment of possible irregularities in 20–22 November 2015. 04-Nov-11 Official start of the electoral campaign at 00:00 CET (UTC+01:00). 10-Nov-11 Deadline for electors residing in Spain to apply for postal voting. 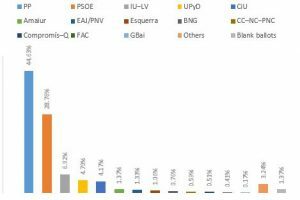 15–19 Novembe 2011 Legal ban on opinion polling publication in Spanish territory. 18-Nov-11 Official end of the electoral campaign at 24:00 CET (UTC+01:00). 20-Nov-11 Election Day. Polls open from 09:00 CET to 20:00 CET. Provisional vote count officially starting from 21:00 CET. From this day, the incumbent government assumes caretaker functions until a new government is formed. 13-Dec-11 The elected Congress and Senate convene. From the Cortes' convening but without a defined term, the King calls for a round of talks with political parties' representatives so that, depending on each other parliamentary representation, nominate a candidate for Prime Minister, which is submitted to Congress for an investiture debate and subsequent vote. The nominated candidate must muster an absolute majority of votes in the first ballot, or a relative majority in a second ballot to be held 48 hours after the first, in order to be elected. If within two months from the first investiture vote no candidate has obtained the confidence of Congress, the Cortes Generales are dissolved and a new general election called. Spanish Socialist Workers' Party (PSOE) An Electoral Manifesto to Win the Future "Fight for what you want". People's Party (PP) What Spain Needs "Join the change"
United Left (IU) Electoral Proposals "Rebel!" Union, Progress and Democracy (UPyD) My Vote Counts "Each vote counts"
Convergence and Union (CiU) CiU Electoral Manifesto "More for Catalonia"
Basque Nationalist Party (EAJ/PNV) Working for the Basque Country in Madrid "For the Basque Country" & "The Basque Country cans"
Amaiur (Amaiur) Amaiur Commitments "Bridging"